NASA's NuSTAR and its rocket drop from the carrier "Stargazer" plane. NASA's new black hole-hunting, X-ray telescope was launched into orbit Wednesday from a remote island in the Pacific. This is real life. Managed by SoCal's JPL, the Pasadena-controlled peeper begins a two-year mission to seek out celestial objects in the Milky Way, and other galaxies, that are difficult to see. The NuSTAR telescope, short for Nuclear Spectroscopic Telescope Array, is designed to cut through interstellar dust and gas to capture light that's gone undetected by other orbiting telescopes. Paul Hertz, director of NASA's Astrophysics Division, says the telescope will focus on the "poorly explored hard X-ray region of the electromagnetic spectrum" and could open up "a new window on the universe." The space agency opted for the less expensive air-launch option (instead of rocketing from a launch pad) and sent its $170 million mission into the sky via a Pegasus rocket dropped by an aircraft that took off from the Pacific's Kwajalein Atoll. 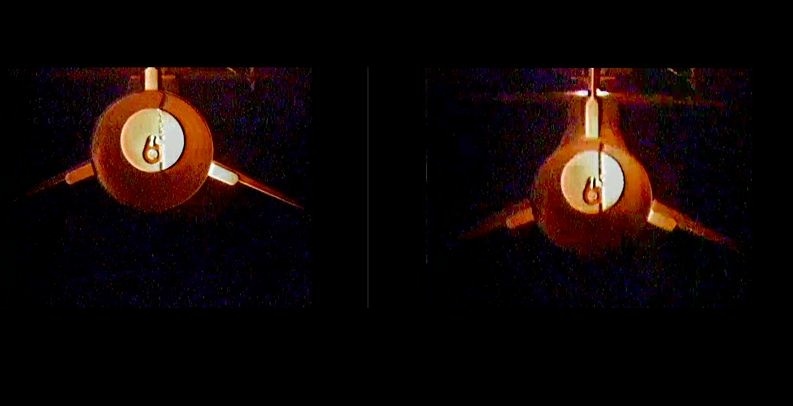 Following a few seconds of free fall, the rocket's engines ignited as planned, and it climbed to space with the telescope separating about 13 minutes later. NuSTAR signaled controllers at 9:14 a.m. as it unpacked its solar panels and settled in for an extended snooping session about 350 miles above the Earth. The craft's 33-foot mast, waiting expectantly inside a small canister, will be unfolded in about a week, says JPL. 23 days after that, operations are expected to begin.